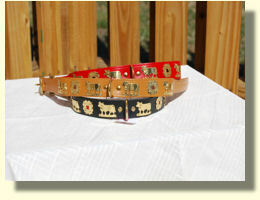 Traditional Swiss Dog Collars Hand-crafted in the Appenzell region of Switzerland. 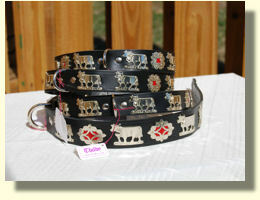 Decorated following folkloric tradition with brass and silver cows and herdsmen ornaments. 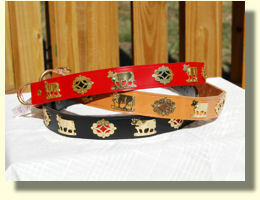 Collars are available in 3 widths and a variety of lengths and colors. 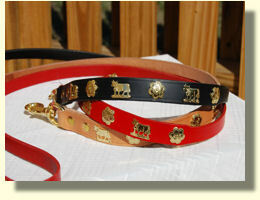 Matching leashes to go with your choice of collar sizes. 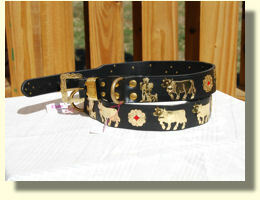 "Measurements for dog collars are made from the buckle to the middle hole	for sizes listed below. Please measure your dogs neck and order accordingly"